Do you have enough Jewish ancestry to call the Land of Israel home? Find out now in your new EURO matches, part of the standard population analysis exclusive to our company. As of this April, data for Israeli Jews from the Department of Human Genetics at Tel-Aviv University have been added to DNA Consultants’ autosomal DNA database. Although not a country like the other populations, the new Jewish data represent a single source, Israeli Jews, once populous in Central and Eastern Europe. 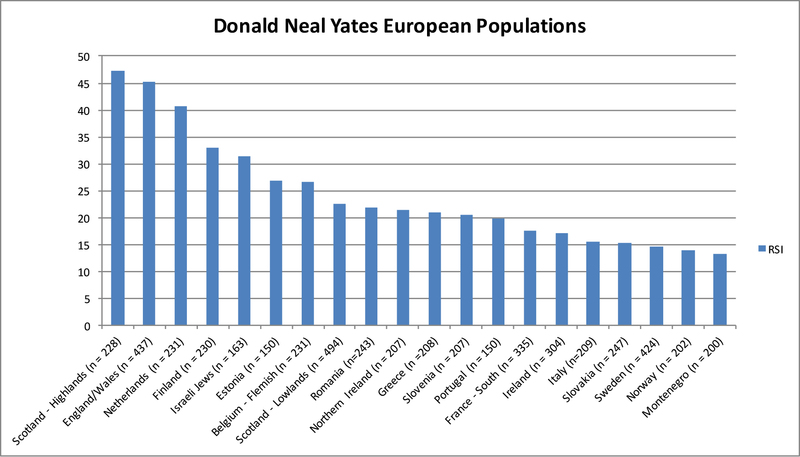 A bar chart of Yates’s European ancestry, such as is included in all DNA Fingerprint Plus reports, appears below, showing the strength of his Jewish ancestry after Scottish, English/Welsh and Dutch. DNA Consultants has been a leader in Jewish ancestry testing since the company’s inception in 2003. Customers can now verify Jewish ancestry, even if it has been hidden in their family history, through matches with four populations and a single megapopulation result, as well as markers reported as Jewish I, Jewish II, Jewish III and Jewish IV. A deluxe Jewish ancestry certificate is available to customers with high matches. With Elizabeth C. Hirschman, Donald N. Yates is co-author of the books When Scotland Was Jewish, Jews and Muslims in British Colonial America and The Early Jews and Muslims of England and Wales. Yates has also written Old World Roots of the Cherokee and Cherokee DNA Studies (with Teresa A. Yates). Customers who took a previous version of the DNA Fingerprint Plus, and who want to see the rank of their Israeli Jews result among their European nationalities, can upgrade either with the EURO Update ($50) or Premium Upgrade ($199).